Indian money refers to relics found around the United States that resemble wampum beads made from clam shells by New England Native American tribes. The term Indian money is a misnomer, as these relics are in fact fossil remains of a sea creature known as a crinoid. Crinoids exist in the oceans today, but nowhere near the numbers and diversity as in the past when the Indian money was created. Feather star represents one of 550 living species of crinoids. Its derives its name from the feathery fringes found on its arms. 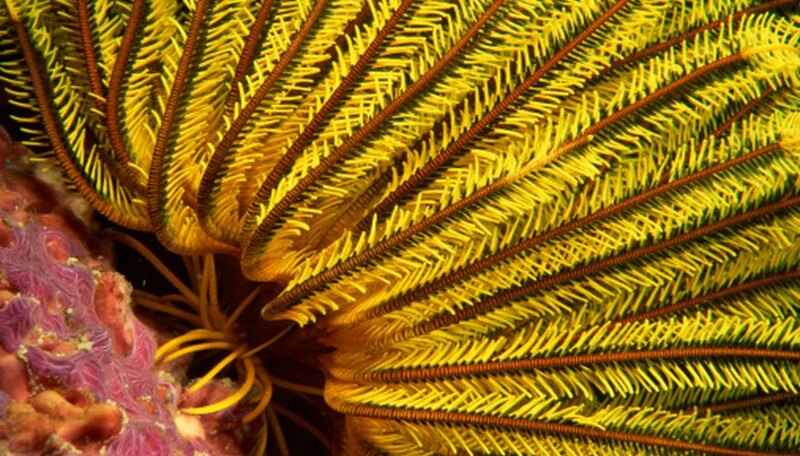 These arms allow the feather star to swim. Another modern day crinoid is the sea lily, which resembles a plant. They differ from feather stars in that they are attached to the ocean floor. They sway back and forth with the currents as plants would. Their stalks are made of stems with disks like their extinct ancestors. Crinoids may resemble plants, but they are animals belonging to the same family as starfish, sea urchins and sea cucumbers -- the echinoderms. This family is known for its rough surface and radial symmetry based on five or multiples of five. The fossil remains known as Indian money consist of stem pieces of crinoids. These pieces resemble the stems of modern day crinoids. Scientists believe, based on these fossils, that crinoids have been part of the ocean environment for at least 490 million years. In past times, the ocean floor was covered with many now-extinct crinoids that behaved like their modern descendants. Examination of the fossil remains by scientists reveal the extent of the extinct species. Many more species died than survived to the present day, with fossil records indicating that almost all crinoids died out approximately 250 million years ago. Fossil remains of segmented arms belonging to stemless crinoids have been found in Kansas, according to the Kansas Geological Survey. They represent an unusual find, as the only fossil of a crinoid is generally the stem. These finds, which scientists date at approximately 75 million years ago, provide scientists with a better insight into the extinct creatures that collectors call Indian money. Crinoid fossils are found in wide ranging locations, from Pennsylvania to Tennessee to Kansas. These discoveries of Indian money in diverse areas indicate that oceans covered these lands at one point in the past. Another indication of the widespread range of the now extinct crinoids and their large numbers are the large limestone deposits in North America and Europe that are made of crinoid pieces. Alley, Robert. "What Are Indian Money Fossils?" Sciencing, https://sciencing.com/indian-money-fossils-8176938.html. 25 April 2017.